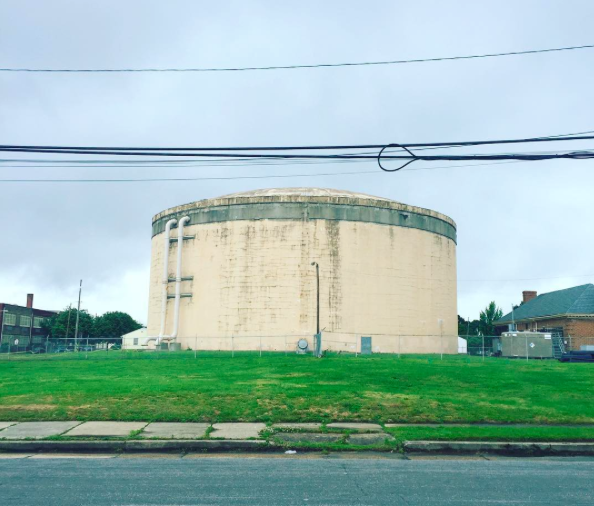 It’s been almost 4 years since we first heard that the Church Hill Water Tank was slated for replacement. The 5.0 MG concrete tank, used to provide processed drinking water to customers in the East End, was built in 1954 and has reached the end of its useful life. The project involves building a 4.8 MG new tank, putting it in service, and then demolishing the old tank. The new tank will be south of the existing tank behind the Church Hill Pump Station building. While construction was originally slated to take place in 2014, the project went for bid this past fall. It looks like work is set to begin soon: the sycamore tree along 30th Street was recently taken down, and the site has marked with flags and fencing. I’ve put in a call to DPU and will post back when I hear back. Any chance the new one could be more attractive? Not that I would want the city spending a ton of money on aesthetics when there are more pressing concerns, but it sounds like whatever they build is going to be around for a while, so they might as well get it right while they have the chance, no? @2 per the plans above, it will sit closer to M Street. Apparently it will be basically the same type of tank but probably have a metal side rather than concrete? My concern is the smaller size?